The Smart Turner is the perfect tool whenever you are going to roll or turn a log. You keep the log in a firm grip through the whole process, which makes it impossible for the log to roll back when you take a new grip. Patented and awarded! 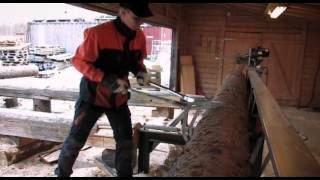 It is also useful when you are working with a sawmill. Whenever you are going to roll or turn a log, whether it is at the sawmill, out in the woods or in the woodyard, this tool will really do itself justice. Comparing standard cant hooks with the Smart Turner is the same as comparing an adjustable wrench with a reversible ratchet. You keep the log in a firm grip through the whole process. In addition, you can turn the log a little bit at a time and work with your knees, which spares your back and makes you incredibly strong. When working with a sawmill, half the time is spent on rolling and turning logs, and taking care of the sawn timber. Due to this, we saw an opportunity to considerably increase the daily output with an improved tool for log management.